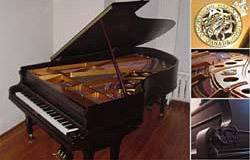 October 2001: The Loop Films Limited contacted Paddon Piano Services. They were in search of a large grand piano for the set of the film “Chicago”, starring Catherine Zeta-Jones, Renee Zellweger and Richard Gere. Three months previously, Jamie Paddon had assessed an eight-foot grand piano located in one of Ed Mirvish’s old buildings located on King Street West. The new owner of the building was interested in selling the piano. 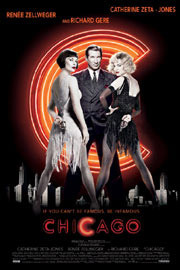 The head set designer of “Chicago”, Gordon Simm met Jamie Paddon at the piano’s location. Gordon Simm took pictures of the instrument and requested that Jamie Paddon dance on the piano for some of the shots. Little did she know that the next woman to dance on the piano would be Catherine Zeta-Jones. The piano was purchased by The Loop Films Limited, and then delivered and gutted by Paddon Piano Services. After production of “Chicago” ended, Paddon Piano Services obtained the piano. The piano has since been completely rebuilt and refinished.